In a fitting tribute to Princess Diana, Kate is said to be wearing the same South Sea Pearl accessories worn by William's mother to a concert at the Royal Albert Hall in 1991. 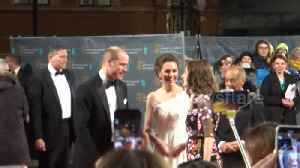 The Duchess of Cambridge arrives at the 72nd annual EE British Academy Film Awards at London 's Royal Albert Hall on Sunday evening with husband Prince William. Kate Middleton Just Stepped Out in Her 2017 BAFTA Gown — and She Made One Major Alteration to It! Kate Middleton arrived at the 2019 Portrait Gala in a refashioned black floral Alexander McQueen tiered gown from the 2017 BAFTAs.